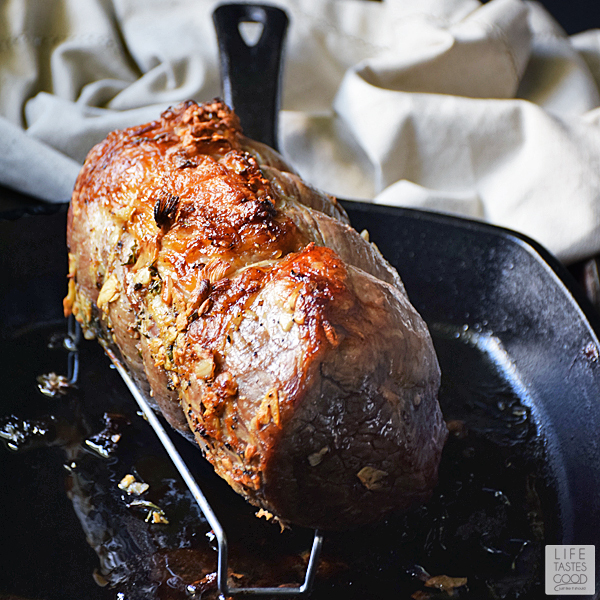 Gather the family around for #SundaySupper to enjoy this beautiful Garlic Roast Beef. With a crisp garlicky crust on the outside and juicy inside, this elegant meal is special enough for holidays! I grew up in a meat and potatoes family. My mom has a signature roast beef recipe that is a family favorite. Mom always served her roast beef for special occasions and we all looked forward to it. It's one of those recipes that cooks all day, while the amazing aroma fills the house, building the anticipation until we get to savor that first marvelous bite! I can almost detect that wonderful aroma just thinking about it! Good memories! 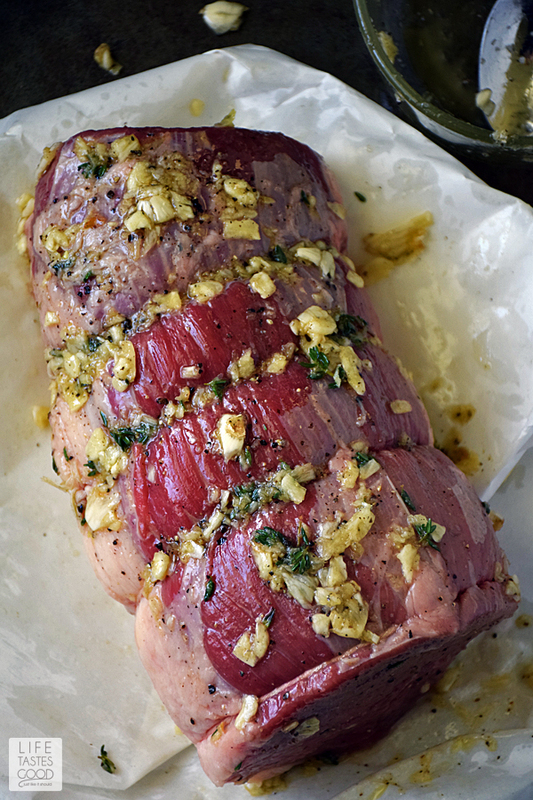 My mom's recipe is a closely guarded secret, but I did pick up a few tips from her and developed this Garlic Roast Beef recipe to share with family and friends for special occasions and during the holiday season. It is a little easier to make and just as special in its own way. I chose an eye round roast for this recipe as it is an economical cut of beef that slices nicely. When sliced thinly, the leftovers make amazing sandwiches! The eye round can be tough, so it is important to cook it no more than mid-rare and slice it as thinly as possible. Because I feel strongly about this, I will say it again, an eye round should not be cooked more than mid-rare. If you must cook it longer, I recommend visiting the Certified Angus Beef® brand website for more roast options to choose a fattier cut that won't dry out quite as much when cooked past mid-rare. A lean cut, such as the eye round, typically gets a bad rap for lacking flavor and being dry. It just doesn't have the marbling that would normally melt into the meat creating that wonderful flavor and juiciness. 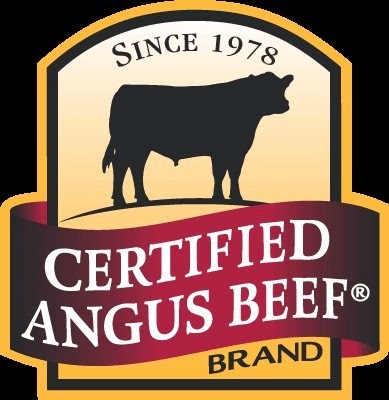 However, a Certified Angus Beef® brand eye round is different. 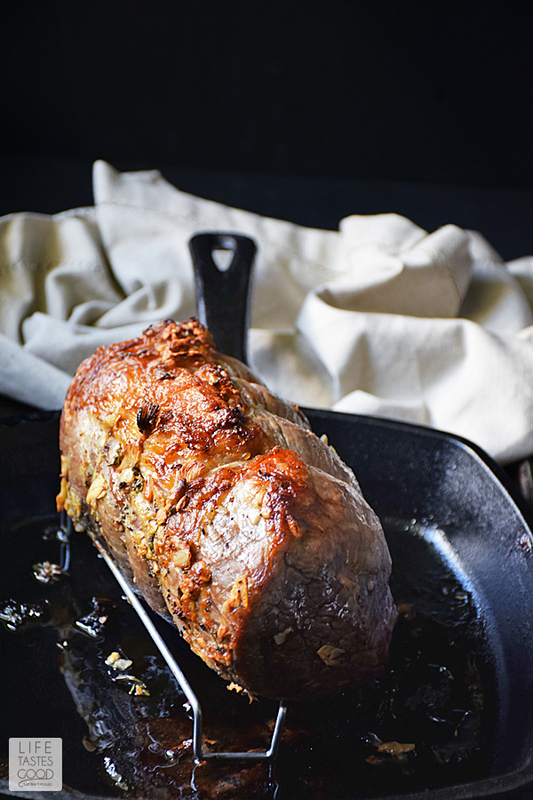 It has great flavor and, being much less expensive than the tenderloin, it makes a great choice for this roast! 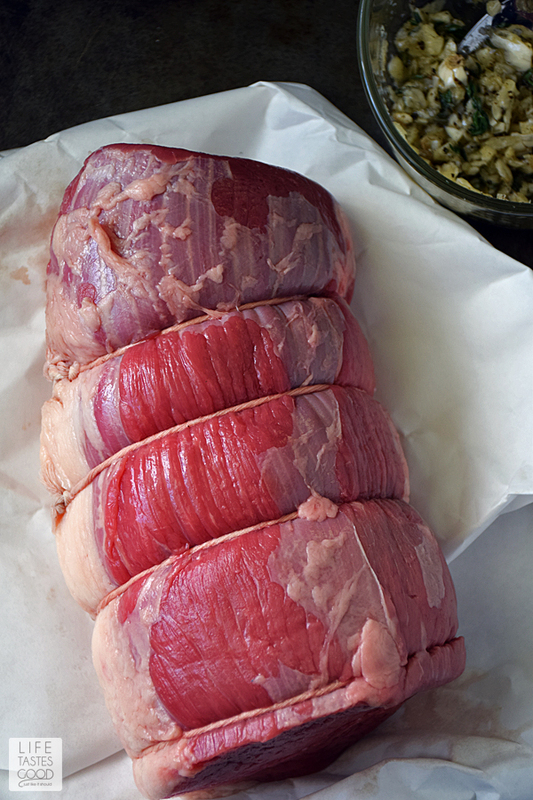 Prepare the beef the day before you plan to roast it. Combine 1 tablespoon olive oil, with 1 1/2 tablespoons freshly minced garlic, 1 teaspoon freshly chopped thyme leaves, 1 teaspoon kosher salt, and 1 teaspoon freshly cracked black pepper. Rub all over roast. Wrap roast tightly in saran wrap and refrigerate overnight. I place the roast in a container in case of leaks. Remove the roast from the refrigerator about an hour before roasting to allow it come to room temperature. 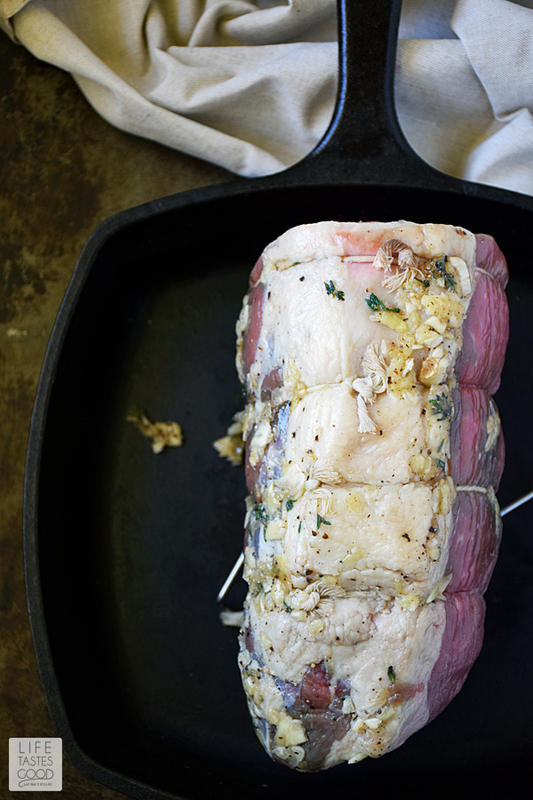 Bringing the roast to room temperature will ensure more even cooking throughout. Preheat the oven to 500°F when you are ready to roast the beef. When dry roasting like this, it is important to place the roast on a rack with the fat cap up as pictured below. There won't be a lot of pan juices with this lean roast, but elevating the roast on a rack allows air to flow all around for even cooking with a crispy outside. You can use a roasting pan with a rack or a 10-12" cast-iron skillet with a small rack as I did. I like to use the cast-iron skillet. It makes it easy to whip up the au jus and it's very easy to clean too. I like that! The beef is blasted at high heat for 15 minutes to develop a beautiful crust on the outside. 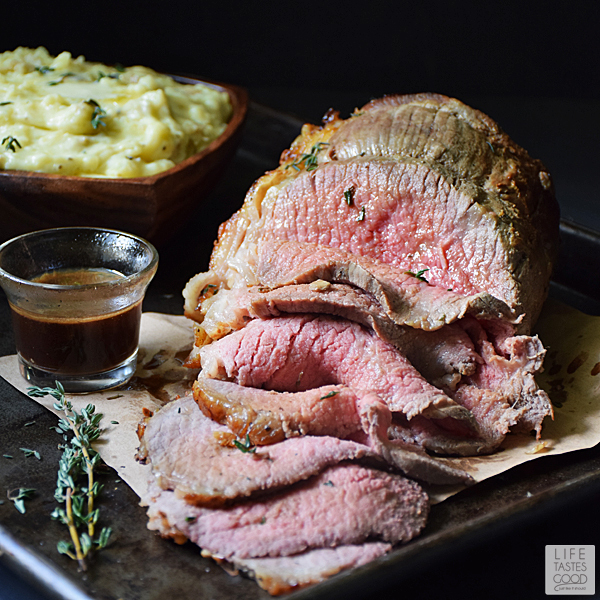 To finish the roasting process, the oven is turned off completely for 15 minutes per pound (3lb roast = 45 minutes) or until an instant-read thermometer registers between 125° and 130°F to achieve a wonderfully moist and flavorful end result. For mid-rare, I suggest cooking 18-20 minutes per pound. TIP: When in doubt, it is best to under cook the roast slightly rather than overcook it. After it is sliced, you can always add the under cooked slices to the skillet with the au jus and cook to your desired temperature. When the roast is done to your liking, remove it from the skillet to a carving board for resting. Prepare the au jus in the same skillet by first deglazing the skillet with 1/4 cup red wine. Be sure to scrape any browned bits from the bottom of the skillet to incorporate with the wine. Bring the wine to a boil and add 1 cup beef stock. Simmer until the liquid in the skillet is reduced by 1/2 - about 10 minutes. Add 1 teaspoon fresh thyme leaves. Give the sauce a taste and add salt and pepper as needed. Serve with the sliced roast beef. Although, this method for dry roasting an eye round is very easy, roasting beef for a holiday meal can be a scary venture. That is, until now! The Certified Angus beef brand understands the fear of roasting and is here to help! They have created the most comprehensive and user friendly roasting app on the market to help home cooks everywhere feel confident when making their holiday beef meals! 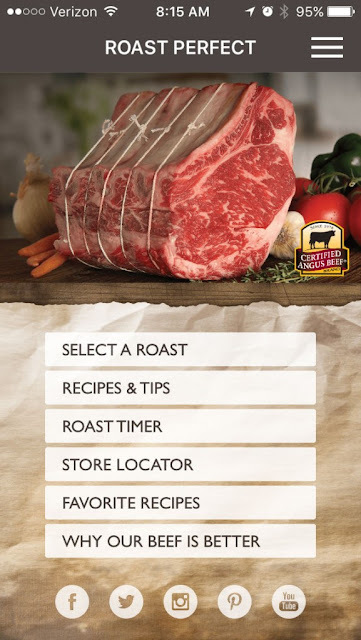 The app, Roast Perfect, gives suggestions on cut and size, calculates exact cooking times, provides tested recipes, educates on how to work with your butcher, and identifies the locations where you can buy Certified Angus Beef. How great is that?! The Roast Perfect app is a must-have tool for holiday cooking! Remove the roast from the refrigerator about an hour before roasting to allow it come to room temperature. Bringing the roast to room temperature will ensure more even cooking throughout. Preheat the oven to 500°F when you are ready to roast the beef. When dry roasting like this, it is important to place the roast on a rack with the fat cap up as pictured below. There won't be a lot of pan juices with this lean roast, but elevating the roast on a rack allows air to flow all around for even cooking with a crispy outside. You can use a roasting pan with a rack or a 10-12" cast-iron skillet with a small rack as I did. I like to use the cast-iron skillet. It makes it easy to whip up the au jus and it's very easy to clean too. I like that! Place the roast in the preheated oven and cook for 15 minutes to develop a beautiful crust on the outside. After the first 15 minutes, turn the oven off completely and cook for 45 minutes for a 3lb roast cooked to 125°F. LEAVE THE OVEN DOOR CLOSED. If you open the oven door, you will lose heat and this will result in your roast not cooking thoroughly. After 45 minutes, check the temperature of the roast by inserting an instant-read thermometer in the center. It should read between 125° and 130°F. If you prefer your roast a little more cooked, I recommend blasting at 500°F for the first 15 minutes and then turning the oven off and leave the roast, undisturbed, for 18-20 minutes per pound. For a 3 pound roast cooked to mid-rare you would leave it in the oven for 54 minutes to an hour until your desired degree of doneness. When the roast is done to your liking, remove it from the skillet to a carving board for resting. Allow to rest for 15-20 minutes before slicing. Prepare the au jus in the same skillet by first deglazing the skillet with 1/4 cup red wine. Be sure to scrape any browned bits from the bottom of the skillet to incorporate with the wine. Bring the wine to a boil and add 1 cup beef stock. Simmer until the liquid in the skillet is reduced by 1/2 - about 10 minutes. Add 1 teaspoon fresh thyme leaves. Give the sauce a taste and add salt and pepper as needed. Serve with the sliced roast beef. TIP: When in doubt, it is best to under cook the roast slightly rather than overcook it. After it is sliced, you can always add the under cooked slices to the skillet with the au jus and cook to your desired temperature. Remove the string around the roast. Slice the roast as thinly as you can. A very sharp knife helps or you can even use an electric knife. Serve with the au jus and enjoy! That is a beautiful roast Marion! I am really excited about the #RoastPerfect App and I am looking forward to making some more amazing roasts with CAB! Marion, that roast is EPIC!! Those slices of roast beef are so thin and juicy! STUNNING images. And wow, how delicious that meat looks! This looks so amazing; gorgeous pictures! Looks delish for the holidays! Mmm... this looks so darn tasty. I haven't had roast beef in forever! And so many leftovers possibilities. Thanks for sharing! 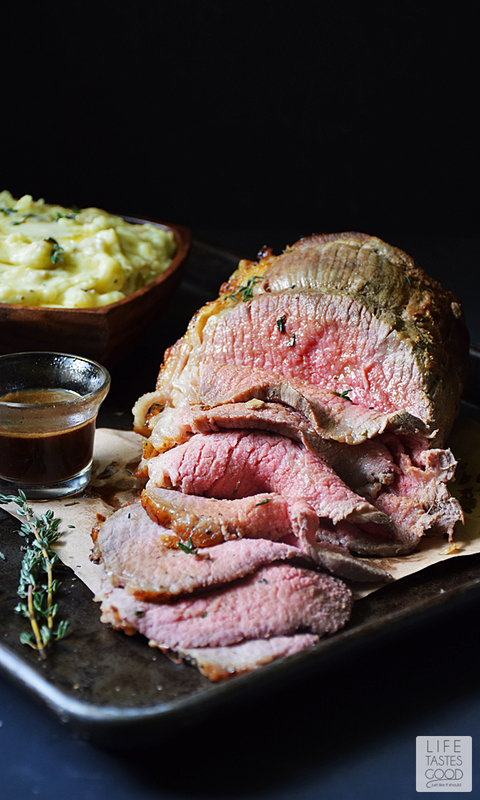 Garlic and beef roasts go perfectly together. Yum! Picture perfect Marion! Love that garlicky crust! Eye of round roast is my mother-in-law's favorite. I'll have to cook this one for her. Love all that garlic. This is one delectable roast. That is such a perfect roast! Simply beautiful! Absolutely gorgeous and stunning photos on a perfectly cooked beef roast! That is one gorgeous hunk o' beef right there!! I was reading about this wonderful recipe when I realized we are neighbors. I go to Petty's from time to time. I don't often find people from this neck of the woods just poking around reading recipes. Glad I found you. I made this recipe last night. The meat was delicious!! However the cooking time was completely off! I had to cook our roast for additional 30 minutes. Thanks for your lovely recipe. Eye of Round, when property cooked, makes an awesome roast. Hi Marion. I am serving 20 for Christmas dinner. I couldn't get a prime rib bone out roast big enough so I bought 2. Re roasting time - do I calculate the weight of both roasts and cook accordingly or do I put them both in and use the cook time for just one? I'm sure this is simpler than it seems but if it were 2 sheets of cookies that time wouldn't vary. Thanks very much. Hi, If you are using 2 roasting pans & leave plenty of space around the roasts like you do with cookie trays - it will be the time it takes to cook one roast - maybe just a little bit longer. Use the free Roast Perfect app (get in the app store) to determine cook time and the timer in the app is great! If the roasts are not of equal size be sure to take the smaller one out before it overcooks. Use a thermometer - a probe thermometer is best, but an instant read works great too - just be sure to check the temp near the end and cook to the temperature you desire. Not the time on the clock. The timer in the app is fabulous, but always play it safe and check the temperature to ensure perfection. Alternately, if you are using one roasting pan, you can tie the two roasts together (end to end) and cook as one. With this method you would use the combined weight of the roasts. I also want to point out that the recipe on this page is for an eye of round roast. 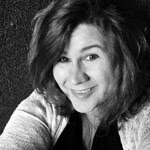 I have 2 prime rib roasts on the site, so do a search for those. One is a traditional method like you will do with the roast perfect app and the other is a slow roasting method that takes more time for the roasts to cook. Both recipes yield fantastic results. I hope that helps. Have a very Merry Christmas and enjoy that prime rib. It is such a treat for the holiday! If you have any other questions don't hesitate to ask. I'll be monitoring my messages and emails to try to answer quickly.